In a medium-size mixing bowl, combine the lemon juice with about 2 cups of cold water. Set aside. Slice the apples, unpeeled, into matchsticks. As you cut, toss the matchsticks into the lemon water to prevent browning. Once all apples are cut, toss the matchsticks to coat well in the lemon water, then drain thoroughly. In a medium-sized mixing bowl, combine the drained apples and cheese and toss to combine with clean hands. Drizzle with olive oil, and season with salt and pepper to taste. Serve immediately. You might be tempted to cut the matchstick (a.k.a. julienne) apples using a mandoline slicer, but in our experience, a mandoline just turns even the firmest of apples into applesauce. 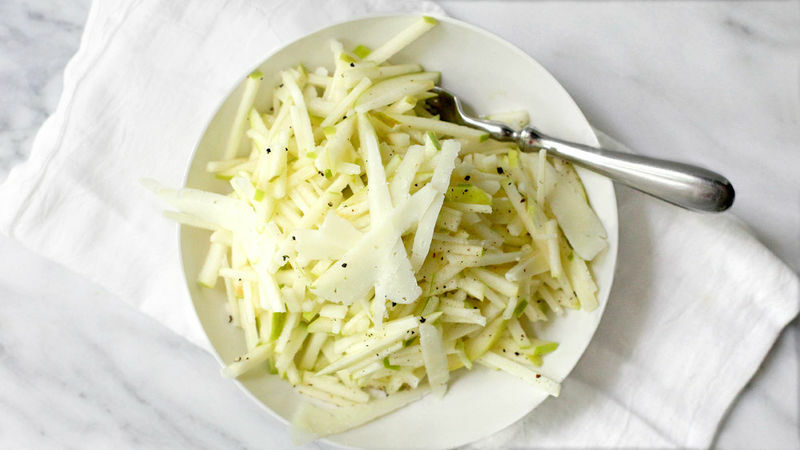 This slaw is a job for a sharp knife and a steady hand. The lemon water treatment will keep the apples from going brown for a few hours, but this is best served immediately after your make it.